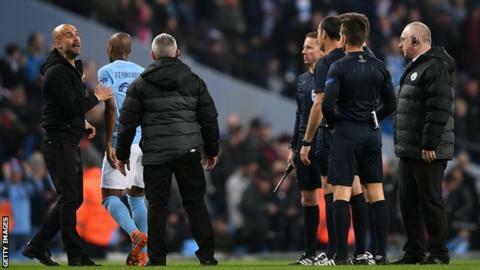 Manchester City boss Pep Guardiola has been charged with improper conduct and being sent off during Tuesday’s Champions League defeat by Liverpool. European governing body Uefa has also charged Liverpool after fireworks were set off and objects thrown inside Etihad Stadium. Guardiola was sent to the stands after confronting referee Antonio Mateu Lahoz on the pitch at half-time during the quarter-final second-leg 2-1 defeat. The case will be heard on 31 May. The improper conduct charge against Guardiola is for communicating with the bench during the second half. Article 69 of Uefa’s disciplinary regulations states that any manager or coach who is sent off may not communicate “directly or indirectly with the team’s players and/or technical staff during the match”. Guardiola went on to the pitch to challenge Lahoz after Leroy Sane had a goal disallowed for offside, despite replays showing Liverpool midfielder James Milner got the final touch through to the City winger. Liverpool were already facing four Uefa charges over the setting off of fireworks, throwing of objects, acts of damage and crowd disturbances after City’s team bus was attacked at Anfield prior to the first-leg on 5 April. That case will also be heard on 31 May. Having won the first-leg 3-0, Jurgen Klopp’s side completed a 5-1 aggregate win to reach the semi-finals for the first time in 10 years. The semi-final draw is on Friday at 12:00 BST in Nyon, Switzerland.